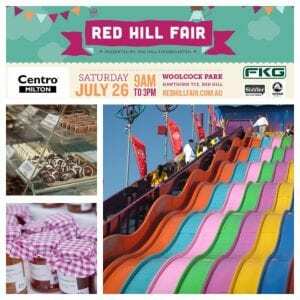 Calibre is proud to be a part of the 32nd Red Hill Fair! Saturday 26th July 2014 sees the 32nd instalment of the Red Hill Fair, a fantastic community event for kids and big kids alike. The Fair has become somewhat of an iconic event in the area and plays host to over 8,000 people each year. Come and visit us between 9am and 3pm at Woolcock Park, Red Hill for a fun filled day full of rides, great entertainment, petting zoo, trash & treasure, raffles, awesome coffee, burgers, a bar and heaps of great stalls. Each year the Red Hill Kindergarten host the Red Hill Fair at Woolcock Park – the only fundraising event performed by the kindergarten. It is one of the area’s biggest community events and a yearly ritual for many local families. Firstly, it provides income. We do receive some Government funding, and this plus money from fees is used to pay for all general expenses, like the balance of salaries for teachers and everyday operating costs (electricity, rent, phone etc). The warm and fuzzies, like building and playground maintenance and upgrades, and new equipment and books needs to be supplemented. We all want our children to have great experiences and great facilities, but the reality is this often costs, which is why the Fair and the money raised is so important. Secondly, the Fair provides a link with our community and shows the children that we are connected to that community. Hosting a fabulous day out, which is free of charge, helps promote Red Hill Kindy to our neighbours. Last year we used the money to complete stage two and three of the garden project which was more indigenous plantings, more community spaces (places for parents and prams and “sitting spaces”), investing in spaces that enrich the sustainability elements of our early childhood curriculum and more natural spaces in the outdoor environment, like vegetable garden beds and planting stations. The money raised from the 2014 Fair will be used partly for the enclosure of the downstairs children’s room and to carry out the second phase of the yard and garden rebuild – which is the re-design and the rebuild of the older area of the kindy yard.